Exploring the Philippines does not end with its fascinating beaches, luscious food, warm people, and rich culture. Knowing the cities in the Philippines that make up the country will surely help you in choosing the best place to stay. Below is a list of the top ten largest Philippine cities. The City of Manila, or simply Manila, is the capital of the Philippines and one of the 17 cities and municipalities that make up Metro Manila. It is located on the eastern shores of Manila Bay, in the western portion of the National Capital Region, on the western side of Luzon. Manila is one of the central hubs of a thriving metropolitan area home to around 20 million people. As of 2009, Manila ranks as the world's eleventh largest metropolitan area and the fifth largest urban area by population. Manila is also ranked as one of the most densely populated cities in the world. The city itself has more than 100 parks scattered throughout the city. Caloocan is one of the Philippine cities and municipalities that make up Metro Manila in the Philippines. Located just north of the City of Manila, Caloocan is the country's third most populous city with a population of 1,378,856 as of the 2007 census. The city is historically significant because it was the center of activities for the Katipunan, the secret militant society that launched the Philippine Revolution during the Spanish occupation of the Philippines. It was in a house in Caloocan where secret meetings were held by Andres Bonifacio and his men, and it was within the city's perimeters where the very first armed encounter took place between the Katipunan and the Spaniards. The City of Davao is the largest city located on the island of Mindanao in the Philippines. It is also one of the most progressive Philippine cities. Its international airport and seaports are among the busiest cargo hubs in the southern part of the Philippines. Davao City is also one of several cities in the Philippines that are independent of any province. The city serves as the regional center for Davao Region. It has a population of 1,363,330 (2007 census) and is named by the Foreign Direct Investment Magazine as the 10th "Asian City of the Future".In recent years, Davao City has emerged as the business, investment and tourism hub for the entire southern Philippines. The city boasts of some of the finest beaches and mountain resorts in the country and its proximity to the Philippines’ most captivating diving spots as well as its highest peak, Mount Apo. Davao City is the premier City and hub of Mindanao. It is a "Crown Jewel" of Mindanao in terms of economic activity. It is the most important economy on the island and the third most important urban center of Philippine cities. Cebu City is the capital city of Cebu and the second largest of the Philippine cities, the second most significant metropolitan center in the Philippines and known as the oldest city in the country. The city is located on the eastern shore of Cebu and was the first Spanish settlement in the Philippines. Cebu is the Philippines' main domestic shipping port and is home to about 80% of the country's domestic shipping companies. Cebu also hosts the second largest number of international flights to the Philippines and is a significant center of commerce, trade and industry in the Visayas and Mindanao regions. According to the 2007 Philippine census, the city has a population of about 798,809 people. Cebu City is the center of a metropolitan area called Metro Cebu, which includes the cities of Mandaue, Lapu-Lapu and Talisay. 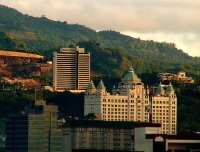 Metro Cebu has a total population of about 2 million people. The Mactan-Cebu International Airport, located in Lapu-Lapu City is only a twenty-minute drive away from Cebu City. To the northeast of the city are the Philippine cities of Mandaue City and the town of Consolacion, to the west are Toledo City, the towns of Balamban and Asturias, to the south are Talisay City and the town of Minglanilla. Across Mactan Strait to the east is Mactan Island where Lapu-Lapu City and an aquarium attraction are located. Zamboanga is a corrupted word for the Bahasa Sug jambangan, which means garden. The highly-urbanized city is located on the island of Mindanao in the Philippines. It is one of the first chartered Philippine cities and the sixth largest in the country. Zamboanga City is also one of several cities in the Philippines that are independent of any province, though it is usually grouped with Zamboanga del Sur for statistical purposes. The economy of Zamboanga city is mostly focused on agricultural and aquacultural activities. Agriculture and fishing provide an income to 70 percent of the population, while the remaining 30 percent are in rural activities. Zamboanga is known to be the Center of Trade, Business and Industry in the Zamboanga Peninsula Region and even within the island of Mindanao. Antipolo City is a Philippine city located in the province of Rizal; about 25 kilometers east of Manila. It is the seventh most populous city in the country with a population of 633,971 in 2007. It was converted from a municipality into a component city of Rizal Province on April 4, 1998 under Republic Act No. 8508. A new provincial capitol was inaugurated in the city in March 2009 to replace the old capitol in Pasig City which has long been outside the jurisdiction of Rizal Province; after Pasig was included in Metro Manila in 1975. With the transfer of the provincial government to Antipolo, it is highly favored to be officially designated as the new capital of the province. The city is popular for being a pilgrimage site. It prides itself as the "Pilgrimage Capital of the Philippines." The Marian image of the Our Lady of Peace and Good Voyage or the Virgin of Antipolo, which was brought in from Mexico in 1626, and enshrined in the Antipolo Cathedral has a continuous following among Filipinos Catholics since the Spanish era. A popular custom of pilgrims to the Virgin of Antipolo is the trek going to its shrine on the eves of Good Friday and May 1 from various locations in Rizal Province and Metro Manila. Some pilgrims would begin the trek from Quiapo Church in Downtown Manila following the procession of the image. There is also an existing custom to have new cars blessed at the church in the belief that this will ensure the safety of the car and its passengers. The City of Pasig is one of the Philippine cities and municipalities that make up Metro Manila in the Philippines. It used to be the capital of the province of Rizal before Metro Manila was formed. Located along the eastern border of Metro Manila, Pasig is bordered on the west by Quezon City and Mandaluyong City; to the north by Marikina City; to the south by Makati City, Pateros, and Taguig City; and to the east by Antipolo City, the municipality of Cainta and Taytay in the province of Rizal. Pasig is a primarily residential and industrial city but increasingly becoming a growing commercial area. Being the former capital of Rizal, the old provincial capitol was located in Pasig, on the outskirts of Shaw Boulevard. In its city proper lies the Immaculate Conception Cathedral, one of the oldest churches in Metro Manila. Pasig is one of the three Philippine cities or municipalities appointed by the diocese of the Roman Catholic Church in the Philippines (as the Roman Catholic Diocese of Pasig). Taguig is a city in Metro Manila in the Philippines. From a thriving fishing community along the shores of Laguna de Bay, it is now an important residential, commercial and industrial center. The recent construction of the C-5 highway and the acquisition of the Fort Bonifacio development area has paved the way for the cityhood of the municipality. Taguig City lies on the western shore of Laguna de Bay and is bordered by Muntinlupa City to the south, Parañaque City to the southwest, Pasay City to the west, Cainta and Taytay on the northeast and Makati City, Pateros, and Pasig City to the north. Taguig River, a tributary of the Pasig River cuts through the northern half of the municipality and Napindan River, also a tributary of the Pasig forms the common border of Taguig with Pasig City. 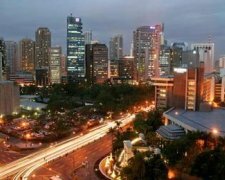 The city ranked first among Philippine cities in the Ease of Doing Business Index, conducted by the World Bank's International Finance Corporation. The City of Valenzuela is a highly-urbanized, first-class city and one of cities in the Philippines that constitutes Metro Manila. The city has 568,928 residents as of August 2007 and is primarily an industrial and residential suburb of Manila. The North Luzon Expressway passes through the city and out of Metro Manila into the province of Bulacan. Valenzuela has a land area of 44.59 km2 divided into several domain: residential, industrial and cultural. It is bordered by Meycauayan City, Quezon City and northern Caloocan City to the east; by Obando in Bulacan to the west; by Malabon City, southern Caloocan City and Tullahan River to the south. Since becoming a city in 1998, Valenzuela’s economy has flourished and its population has swelled significantly.